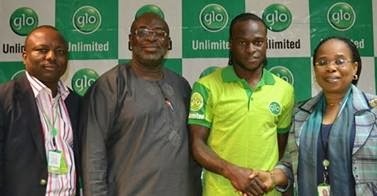 Nigerian International and Liverpool Football Club winger, Victor Moses was on Tuesday in Lagos unveiled as a brand ambassador of telecommunications company, Globacom. Speaking during the event held at the Mike Adenuga Headquarters of Globacom; the Chief Operating Officer of Globacom, Mohamed Jameel stated that the footballer had within his short playing career distinguished himself at both the club and national team levels. He added that the highly talented winger has also been a good inspiration not only to up-coming footballers but also to the younger generation of Nigerians. Jameel said one of the ways in which the company has been promoting indigenous sports as well as arts and culture is through the appointment of enterprising Nigerians in various sectors as brand ambassadors. “This is not only meant to promote the growth of the various industries but also to encourage our teeming youth population to aspire to realise their dreams by looking up to these crop of ambassadors as mentors. “It is in line with our commitment to delivering value and rewarding excellence that we have signed up one of our own, a Nigerian International, a dynamic winger and outstanding member of our victorious National Team, the Super Eagles, Victor Moses to project the Globacom brand across the world,” Jameel stated further.